In our last post we shared the latest update of “The Whim,” a gorgeous cedar-shake sided single wide owned by Marie and Richard. It sits beside a lake in Wisconsin and is, by all measures, a perfect example of the unlimited potential that mobile homes have. The home was situated on a slight slope and has a 9 foot tall basement. Since there isn’t a lot of information about basements under mobile homes I asked Marie to share some of her thoughts on it. 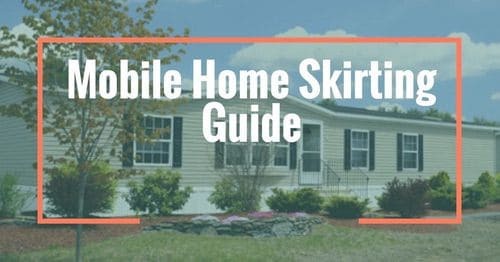 The Whim has been such a great inspiration on Mobile Home Living and with Marie’s proven experience in mobile home DIY she’s a perfect source for us to get information. There are advantages for having a basement. First, it provides somewhat of a shelter in case of a tornado. Although, if a storm is bad enough, the home will fly off the foundation anyway. That could happen to a conventionally built home as well. Second, it provides added storage. Third, in this case of a mobile home, it is much better than skirting! 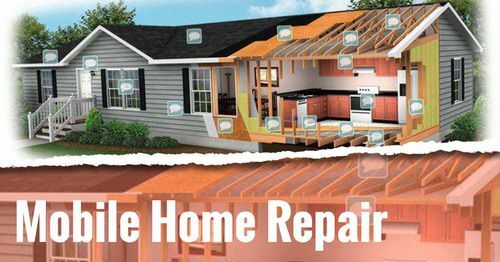 Repairing those can be constant. Wind and snow can take their toll. I cannot tell you how many mobile homes in our area have busted water pipes from our cold Wisconsin winters! Not a pretty sight…. We don’t have to worry about “extra tenants” under our house, either. The previous owner had the foresight to plan the foundation before having the home brought to the sight. It is more difficult to excavate for and build a basement after the home is set. However, the previous owner had neglected to plan for adequate ventilation. We are trying to figure out how to accomplish this. Installing some sort of windows or vents in the walls in between the home and the concrete blocks before everything was set would have been much easier. We are considering installing house vents/fans like you would for an attic on a conventional built house. There may be other options to explore. By not having the proper ventilation, things get mustyand mold grows on everything. Anything soft like paper, cardboard or fabric can be destroyed and soak up any moisture at all. Even though we don’t have any leaking or seepage problems, there is still moisture. The other dilemma is the entrance to a basement. Because the home is already designed and built, these types of homes do not allow for stairwells. 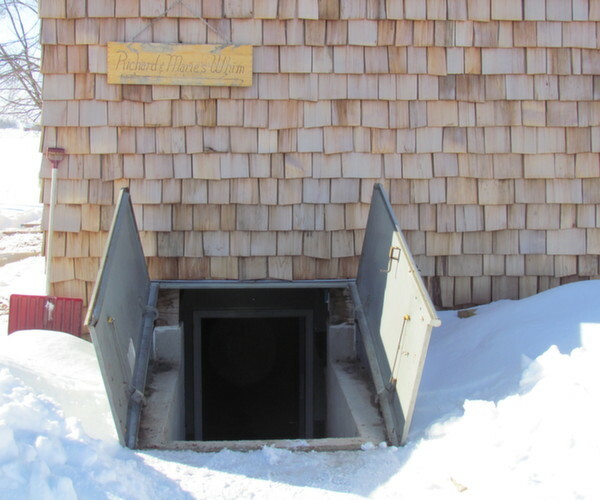 So, the easiest way is to enter through an old fashioned cellar door! We have considered putting in a spiral staircase either in the living room or the area with the laundry. I don’t like this idea. First, because you can’t have a door that separates the main living floor from the basement (odors and bugs can roam free,yuck). Second, because you will also lose what floor space you already have! Although, we could use the laundry area for a conventional stairwell, then those appliances can be moved into the basement. Also, not a good idea because I’ve become accustomed to doing the laundry without going up and down the stairs! That’s a really good concept when in retirement years. The cellar door can be locked, but we don’t do that. Locks can freeze in the winter and get buried by snow. So we lock the door at the base of the stairs leading into the basement. At the opposite end of the basement an overhead garage door provides added warmth and security to our walkout patio doors. I thought this was a very smart idea. 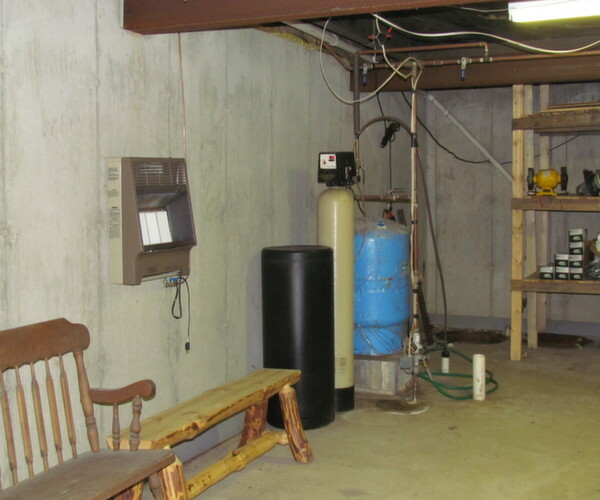 The basement holds our sump pump, water softener and well tank on one end and our recreational things on the other. There are a few shelves built-in next to the stairwell and I set odd things there, like ice fishing tip ups and pottery (until the shed is cleared out from table saws and other large equipment). We are currently also using the basement area to store tools and some supplies during our redo (the shingles were stored in the garden shedand any wood was stacked next to the Whim). I’ve also got a couple sawhorses set up so I can stain and finish the new interior doors and a new exterior door. We’re already thinking of adding a small bathroom (just a sink and toilet) to make it easier and much cleaner than entering the house when having outdoor activities and gatherings. We are also considering dropping the furnace and the water heater into the basement. Doing this will add to the floor space on the main floorand we don’t have to worry about a possible leaking water heater ruining the floors. It will also make the heating/cooling a lot quieter. We recently installed central air to the existing furnace. I would like a stationary tub for heavy duty work outside or for cleaning fish. It stays pretty cool in the basement and with the patio doors open, it adds another area for entertaining if it rains or just to get out of the sun! Basements are too often thought to be something that mobile home owners can’t do. But, it absolutely can be done and the advantages are immense. There are a lot of great advantages to having a basement under your mobile home. Storage, safety, and convenience are only the beginning. There’s also a lot to consider if you are going to install a new home over a basement or if you plan on adding a basement to an existing mobile home. Ventilation and moisture control seem to be the most important aspect that is often neglected. Proper construction methods are equally important. There’s no room for any errors in the setting of the home. 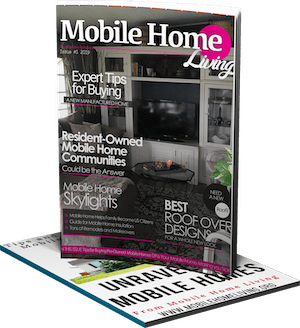 If you plan on installing a basement be sure to hire contractors that have plenty of experience with mobile homes and understands the way they are built. Thanks Marie, for your continuing contributions to MMHL and your endless inspiration. I appreciate you taking the time to share your lovely lake home and for the all the great knowledge. Im so glad i found this page. I am 22 and would like my starter home to be a mobile home. Just enough space. Im interested about the average cost high foundation would cost. Is it something you could do yourself potentially? A foundation would be a project for a professional or at the least someone with a fairly extensive knowledge of construction. If you just want to add skirting that’s a lot easier. Basements and tall foundations are expensive but I can’t really give an accurate estimate because things are a lot less in WV than the rest of the nation (labor mainly). You’d want to get estimates from a few companies to get a good idea. Hello – just purchased a double wide setting on a poured wall basement that has nine foot walls. This basement is a walkout but there is no entrance from inside the home to the basement. Is it difficult to have a staircase put in? It’s a complex job only because of chassis, plumbing, wiring, etc. You need to find a place for the steps that don’t alter any of the structural elements of the home. Other than that, it’s not too difficult. How about using one or more 53′ steel cargo containers underground instead of pouring a concrete basement? That’s one of those questions that an engineer would need to answer. You’d have to reinforce the containers and by the time you did that it may be cheaper to just start from scratch. Could probably work well with the right design, though. Another great post! I recently inherited my childhood home…a 1972 single-wide on a full foundation. I’m in my 40s and had been thinking of filling in the basement, even though I knew the work my dad put into it. After reading about this basement though, I may have to rethink that. The stairs are, and always have been, treacherous and the dampness can be a bit much. I like the idea of having a traditional sort of entryway and bringing the washer and dryer back upstairs. 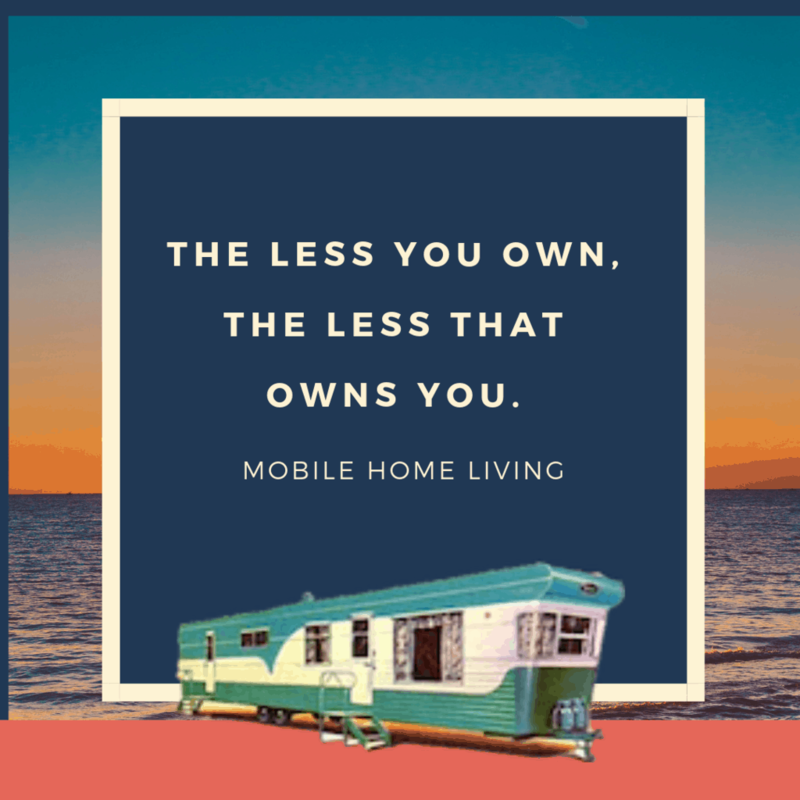 I am so glad I found Mobile Home Living. So many great ideas! Great to hear from you KellySue! I bet you can get that dampness fixed and get the laundry back up stairs fairly easily. There’s some great new products out now that seal basement walls. It is amazing how well it works! Perhaps you have a new play room in your future? Hi, My name is Robert and my wife and I have a double wide manufactured home over a full basement, we love it 🙂 We want to finish it out. How do we attache our wall to the underside? By the way I just discovered your blog this morning..awesome ! Could you please email me a picture or two of your setup and I’ll see what my construction gurus suggest. My email is [email protected]. I’m looking at moving my 14×70 to my new lot in SE Wisconsin . We want to put in a basement but my contractor doesn’t know what we will need for the beams. Do you know who they used to build the basement or where I can get more info on the beams and mounting the house I can give him. If you go there and click Control+F and then type in Basement it will show that the word is used 16 times throughout the book. On page 29 there are a couple of paragraphs that may help (a little, maybe). 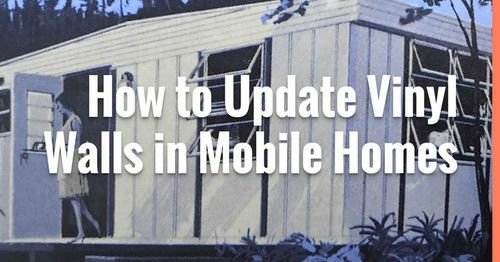 I bet if you called a local manufactured home dealer and asked them a few questions they would be able to help or at the very least give you contact information of a contractor they work with. Thanks so much for reading MHL and sorry I couldn’t be more help! Putting a manufactured home over a basement is the coolest thing ever! It’s actually a fairly simple (yet very complicated) process. Now, I’m not sure about the laws in California – especially with ya’ll having earthquakes and all but I suspect you’d just have to meet whatever codes are in place. 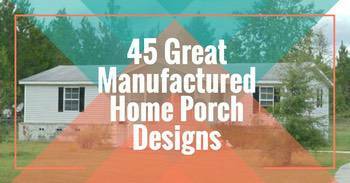 It’s a great idea for increased living space at an affordable price. Here’s a video of a manufactured home being placed over a basement. It’s a really neat process! Please keep me posted if you ya’ll do it – I would love to share the process! I am getting talked into a basement I think (better insulation, having furnace etc. downstairs, …). I hate basements though especially walkouts. 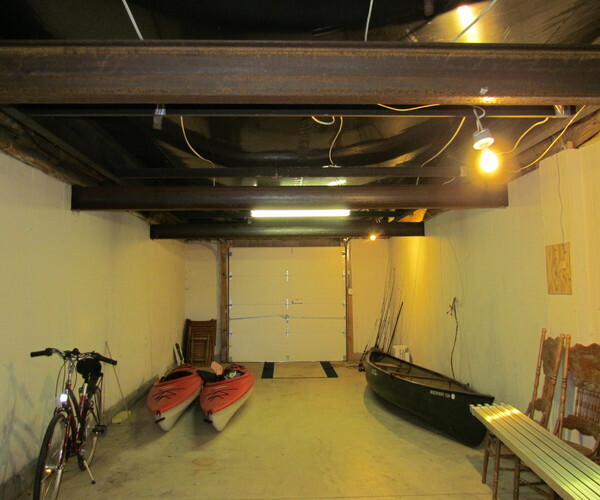 However, I just saw your pic with the garage door and was thinking a garage as basement would be super cool! Any idea if that is feasible? Basements with garage doors are absolutely feasible, all you have to do is make sure it’s properly installed, and the weight of the home is distributed properly on top of the basement structure. I’m not that educated in basement construction but anyone with the required license and experience can help you with the details and there’s even software that can show you exactly what it will look like before you decide on anything. I’ve see one manufactured home that had the floor cutout in the kitchen and had steps going down into the basement, it was a hinged ‘door’ that you would never notice until the owners lifted it up. They had a coal stove, and that’s how they heated the home. It was really neat. Good luck, sorry I couldn’t be of more help. Whenever I visit your blog I found very useful information and very interesting too. This piece of writing is superb , I think the basement is very good option for storage. If anyone has basement in their house it gives advantage for them to store various things in that. Thank you! Admittedly, I’m not a very good writer but I figure with enough photos of pretty homes no one will ever notice the writing..lol. Thanks for commenting! We are looking for a contractor to do this for us. We live in far southwest Wisconsin, Grant Co. Does anyone know anyone that does this in this area? I hope you find a great one! 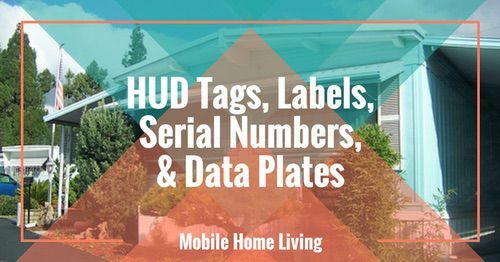 Maybe you could call some of the manufactured home dealers in the area, they may be able to recommend a company for you. Good luck! Hi Jeni! Your home is so awesome and just gets better and better 🙂 Hope all is well! Thanks for commenting! They are fortunate to have the extra space with a basement and nice that it's a walkout. Love the cedar shake exterior and the bank of windows across the front. Hope to see more as the couple tackle the interior. Hi Shirlee! It's good to hear from you again! Hope all is well! I can't wait either. With their style, it's gonna be gorgeous!! Very very cool post. It has been a very long time since I have seen a mobile home with a basement. Nice looking one too.